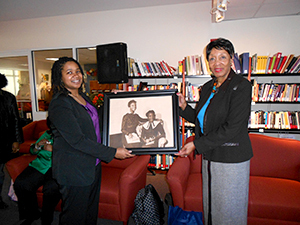 Five framed pieces are on display in the Multicultural Resource Center at UNCG. Two women are featured in each. “My work is meant to be a tribute to Joanne Smart Drane and Bettye Tillman, the first two African American women to graduate from UNCG,” Rachel Propst said. Propst, who graduated last year from UNCG with a BFA degree in design, had been a student off and on since 2005. She is now building up a body of work as she considers applying for a master’s program. The five works are not regular prints, she explained. She created them through a photographic printing process called cyanotype, where ultraviolet light creates the image. Art faculty member Leah Sobsey introduced her to the process. Full story in Campus Weekly.